470 pages | 29 Color Illus. | 300 B/W Illus. 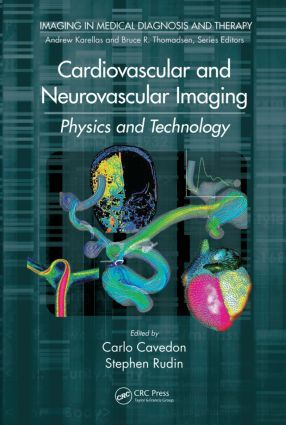 Featuring chapters authored by field experts, Cardiovascular and Neurovascular Imaging: Physics and Technology combines the latest information on the physics and technology of cardiovascular and neurovascular imaging under one cover, providing students, professionals, and researchers with a single, state-of-the-art reference. Dr. Carlo Cavedon is director of the Medical Physics Unit at University Hospital of Verona in Italy, where he also serves as chief radiation safety officer. His scientific and professional interests cover image-guided interventions, image-guided radiation therapy and radiosurgery, quantitative techniques in MRI and metabolic imaging, 4D techniques in diagnostic and therapeutic procedures, Monte Carlo simulation, small-field radiation dosimetry, and radiation safety. He has been serving as professor of medical physics at the Universities of Verona, Padova, and Trieste in Italy since 1998. He is a full member of the American Association of Physicists in Medicine (AAPM), a scientific committee member of the Italian Association of Medical Physics (AIFM), and an active member of several other scientific societies, including the European Society for Radiotherapy and Oncology (ESTRO). Dr. Cavedon has authored more than 150 publications and is frequently invited to speak at national and international meetings. He was an editorial board member of the journal Medical Physics from January 2005 to December 2013 and is currently a senior associate editor. Stephen Rudin, Ph.D, is director of the Radiation Physics Division, Department of Radiology at the University at Buffalo (UB), The State University of New York (SUNY), USA, where he also serves as SUNY distinguished professor. He is the founding director of the Medical Physics Graduate Program at UB, a founding co-director of the UB-Toshiba Stroke and Vascular Research Center, and the radiation safety officer at the Erie County Medical Center. Dr. Rudin is a fellow of the American Association of Physicists in Medicine (AAPM), is certified by the American Board of Radiology and the American Board of Health Physics, serves on the board of editors of the journal Medical Physics, and is a member of 12 professional societies. He has authored more than 400 publications and won numerous awards and honors in the fields of medical imaging, image-guided endovascular interventions, and radiation safety. Dr. Rudin’s research is supported by grants from the U.S. National Institutes of Health and the Toshiba Corporation.